Deception is a politician's middle name. But Obama goes beyond the rule even for politicians. His deceit and dishonesty are revolting. I am most concerned about his pretense, his imposture, to be a friend of Israel. But first let's get to his misinterpretation of John McCain's words that the US economy was "fundamentally strong. " McCain said these words when the fall of Lehman Brothers brought the crisis dramatically to light. McCain did not mean that everything was perfect with the American economy. Attention should be paid to the word "fundamentally." McCain was saying that "fundamentally" the economy was sound, which was and is an arguable position, if we think of the immense US railroad network, electricity grid, road network, manufacturing capacity, skilled work force, and enterprising businessmen as the "foundation." McCain was well aware that there were major problems in the financial sector that needed to be fixed by proper regulations, which he said a few days later. In my view, he was implicitly distinguishing between the "foundation" and the much impaired financial and juridical superstructure which needed repair. By stressing the soundness of the foundation McCain meant to be reassuring at a time of crisis, although aware of major flaws in the superstructure. The Obama campaign deliberately misinterpreted McCain's words as if he were a pollyanna pretending that everything was fine. This misinterpretation caused great damage to McCain and he did not properly respond by pointing to the deliberate misinterpretation on the part of his rivals. Perhaps the McCain campaign thought that any response would just sound like a weak excuse, like so many of Obama's own excuses, and would just get McCain into more trouble. But I am outraged by the dishonesty of the Obama campaign's deliberate misinterpretation, perhaps counting on the semi-literacy of much of the public not to understand McCain's actual intent. Now to the gigantic fraud of Obama's alleged support for Israel. Obama was the friend of Israel's bitter enemies. He listened to outrageous anti-Israel arguments by Khalidi, whose historical research, meant for a small, restricted audience, may be acceptable [I have read books and articles by Khalidi] but whose public, political propagandistic statements are false, slanderous, paranoid, and deceitful and meant to serve Arab mass murderers who enjoy a certain support from Judeophobic circles in the West. If Arab Judeophobia did not enjoy a certain support in the West, then how did al-Khalidi and Edward Sa`id get to be professors at Columbia, a very very Establishment institution?? Just look at the roster of members of Columbia University's board of directors. Zbig Brzezinski too once taught at Columbia, now known to some as Bir Zeit on the Hudson. At the fulsomely praise-ridden [praise for PLO spokesman al-Khalidi] farewell dinner for Khalidi leaving the Univ of Chicago for Columbia that has been the focus of so much controversy lately, an Arab boys dance group performed. We don't know what dances they exactly performed for Khalidi's farewell dinner, but on an earlier occasion they performed mock beheadings of Jews and Americans. [see Debbie Schlussel's report here]. Obama and his crew of professional liars like the kapo-like Miss Roginsky mentioned in our last post, have no scruples when it comes to hiding and denying his links to Judeophobic Arabs and plain and simple Jew-haters like Brzezinski. Don't forget that Zbig helped Khomeini take over Iran, helped Bin Ladin get his start as a terrorist in Afghanistan, and helped to entrench the Syrian invaders in Lebanon. Here is a photo of Zbig in his Dorian Gray ugliness. 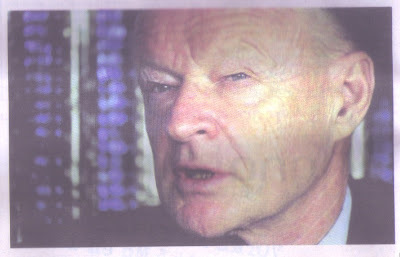 Nessim Cohen-Tanugi calls Brzezinski "Barak Obama's Evil Genius" [Le mauvais genie de Barak Obama] in the title of the article which the photo of Zbig accompanies. Cohen-Tanugi is rather mild in describing Zbig but I won't bother to complain because of the tedium involved in reaching a 100% correct and precise evaluation of this creature from the primordial muck. Suffice it to say that Obama voters are voting for evil. On the other hand, some might want to think that maybe Obama is just ignorant. After all, he once called Iran a "tiny" country whereas Iran has an area of ca. 1,648,000 sq km [= 634,000 sq miles - Statesman's Yearbook]. This number of square kilometers makes Iran today roughly three times [3x] as big as Germany between the two world wars [Germany now is 326,789 sq km - Statesman's Yearbook]. Would Obama have called Germany "tiny" then --or now? Maybe Obama called Iran "tiny" not out of ignorance but in order to minimize the threat that a nuclear Iran would represent, perhaps on the advice of Zbig who helped the current Iranian regime to take power in the first place. If so, then Obama was not being ignorant about geography but rather disingenuous, that is, he was dishonest and deceitful. If so, he was not only being anti-democratic by deceiving the voters, but he was indeed evil as is his mentor Zbig. Coming: The evil, sinister schemes of Zbig as spelled out by Nessim Cohen-Tanugi of the French-language Le Lien newsletter.